It's hard not to feel that tingle of excitement when Amazon plunges into one of its mass sales, most recently, its Spring Sale - offering up tech deals from TVs to cheap smart speakers to smart light bulbs. And mobile phone deals haven't been left out in the cold. With price cuts of up to 25% on top devices including the Samsung Note 9, Galaxy S8 and OnePlus 6 - Amazon is the place to be right now for SIM-free phones. A few of these deals are the cheapest options on the market and the others offer incentives to make them worth choosing over cheaper options, like free memory cards or increased internal storage. You can see the standout deals from Amazon's sale below with both the original price and how much it now costs. 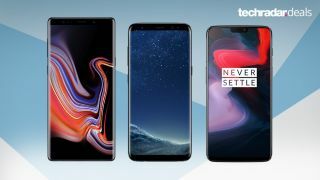 Or if you want to compare these prices with how much devices cost on contract, take a look at our mobile phone deals guide.